Since legendary LSU landscape designer Steele Burden first began planting live oaks, crepe myrtles and azaleas in 1932, the iconic campus greenery has become as recognizable as the Quad’s arches. The LSU campus is now one of the most beautiful in the nation, having been listed among the 20 best campuses in America in Thomas Gaines’ The Campus as a Work of Art, and thrice named a Tree Campus USA by the Arbor Day Foundation. 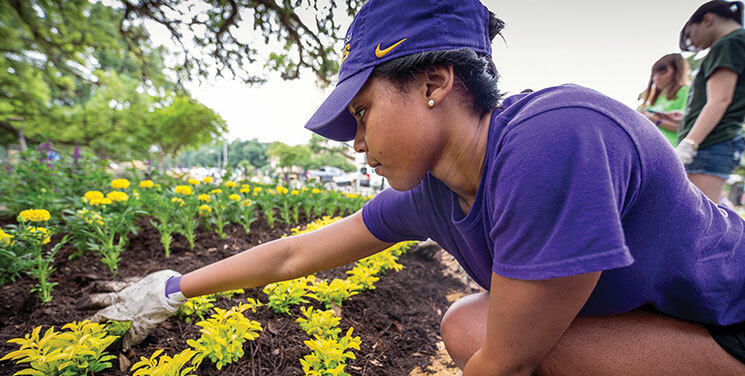 The prestigious reputation is maintained by LSU Landscape Services, which annually partners with LSU Campus Life to give the grounds a fresh face. 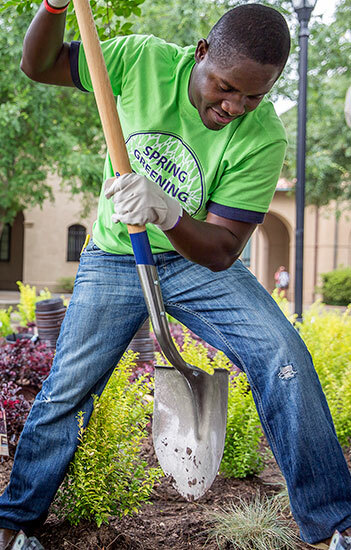 Spring Greening Day is an annual half-day service project to beautify the campus in preparation for commencement, as well as an opportunity for students, faculty and staff to learn about sustainability and personal practices to support the environment. Materials are purchased through the LSU Foundation’s Campus Beautification Fund. April 24 marked the sixth year Tigers have donned gardening gloves and picked up shovels to nurse the campus they love. Despite a rainy forecast, 103 volunteers planted more than 4,700 plants and flowers, including an LSU AgCenter “Super Plant” variety called Serena angelonia. Consistently sponsored by Albemarle, the event supports the Green Tiger Project, which aims to integrate campus beautification with campus sustainability, and supports the Campus Beautification Fund. The fund offers alumni, friends and fans a way to contribute to the university’s campus enhancement efforts, like Spring Greening Day and the living LSU Christmas Tree, a Little Gem Magnolia planted in 2014.